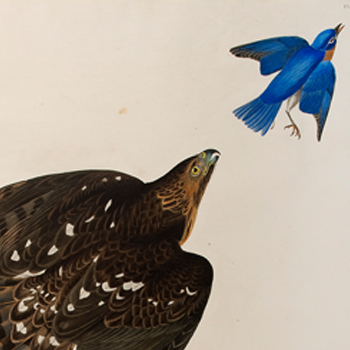 John James Audubon: Swift Birds of Passage presents over fifty works on paper and two rare copper plates by American artist and self-taught scientist John James Audubon (French, Born in Haiti, 1785-1851). Organized by three museums, the Jule Collins Smith Museum of Fine Art at Auburn University, the Taubman Museum of Art, and Oglethorpe University Museum of Art, the exhibition presents rare Audubon prints of birds which are native to or migratory through the Southeastern region of the United States. Audubon, a lover of nature from an early age, was taken with the American landscape, and particularly with its birds. Though he had little formal training, he had considerable natural talent as both artist and naturalist. His keen observational skills along with an eye that remained fresh to the marvels of the new world made him an apt recorder of a world resplendent with flora, fauna, native occupants and endless possibility. Audubon was able to articulate a vision of the yet undiscovered American landscape and its inhabitants. Audubon fused his two talents and interests in the groundbreaking book Birds of America in 1827, which contained 435 life-size engravings depicting 1,065 birds. This trailblazing work became the largest ornithological book ever published and transformed the scientific field while promoting worldwide interest into the unexplored world of North American birds. His work capitalized on American interest in naturalism in the wake of westward expansion, thus greatly impacting and influencing both the fields of art and science. Audubon identified 25 new species and depicted 6 birds that have since gone extinct, including the infamous passenger pigeon. Audubon would observe bird behavior in the wild and then capture them. He would use wire to pose his specimens in different positions in order to create dramatic scenes with highly accurate portrayals. 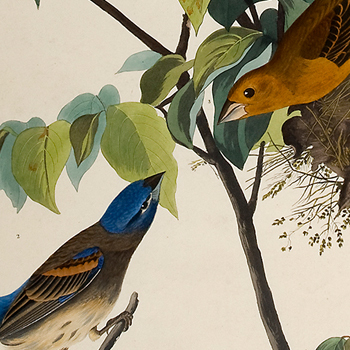 This technique made Audubon’s work innovative in his own time, and as such, his work has remained instructive and influential today. John James Audubon’s masterful work is being showcased for the first time in Southwestern Virginia, offering visitors a rare look at one of America’s most celebrated artists. 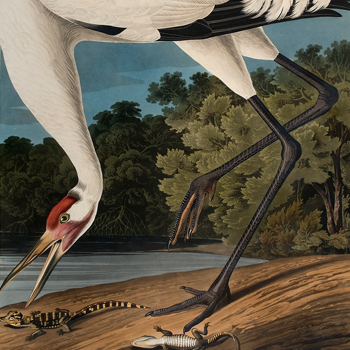 The compilation of prints and plates in this exclusive exhibition will both illuminate Audubon’s legacy and enlighten us on his artistic and scientific endeavors that transcended its own time. This exhibition is made possible by generous loans from the Jule Collins Smith Museum of Fine Art at Auburn University, including more than 30 double elephant folio Havell edition prints as well as works from the Taubman Museum of Art’s collection, loans from the Oglethorpe University Museum of Art and from the New York Botanical Garden’s Mertz Library among others. John James Audubon: Swift Birds of Passage has been co-curated by Amy G. Moorefield, Deputy Director of Exhibitions and Collections at the Taubman Museum of Art and Elizabeth Petersen, Director of the Oglethorpe University Museum of Art with contributions by Grace Scott Bishop, Jule Collins Smith Museum of Fine Art Senior Education Curator. The exhibition will be on view from October 17, 2015 through February 21, 2016 in the Medical Facilities of America Gallery and the Temporary Exhibitions Gallery. Exhibition sponsorship for John James Audubon: Swift Birds of Passage has been provided in part by First Citizens Bank.